That's a fantastic design. I love the colors and the fierceness in Mowgli's face. I love the branches, how they are in the shape of a tiger face. Outstanding. I adore the... fierceness, of the mood, and the background sugestion of Shere Khan through the vines is brilliantly inspired! Well thanks! I really appreciate all of the enthusiasm! I guess I should make a personal note to revisit this project and try to do at least the first chapter. I've run across a comic book version, but the art wasn't as nice as yours. You ought to send this in and propose the project to a publisher. I've had a look at the rest and you have done very well! There brill. Well done. This looks great! Well done! I will have a look at the others. I'm real glad you guys like it. 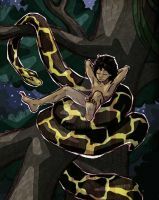 While reading Kipling's book, it's not difficult to fit that sort of feral nature into Mowgli's character, so long as you don't think of him as how Disney portrayed him. If you ask me, Kipling's book is infinitely better than the Disney movie, even though I still enjoy the latter. And yeah, I'd love to dish out some more pages on the story. I'll update the gallery of course when I have more to show. This is pretty impressive stuff. I think you've really succeeded at binging out the aspect of Mowgli's character that a lot of adapters miss, namely his mixture of ferocity and innocence. I really hope you're planning to adapt the entire book for publication - if so, I'm sold. great job,outstanding composition and lines,nice colours!